Life – including the sustainment of a dissipative structure as the FTS – requires an intermediary level of entropy: Not too much entropy – too much disorder – and not a too low level entropy (too much order). Survival – continuation of operation, and thus the ability to maintain a certain order (intermediate level of entropy) FFE – requires adaptability: The conditions continuously change, and survival requires that change cannot be left unanswered. The increased ability of rival states to compete for scarce resources cannot be ignored. Change contributes to and stimulates more change, including by novelty by combination: the complexity of these systems FFE constantly increases. Georgescu-Roegen formulates the requirement for an intermediate level of entropy to sustain life, as follows: “life is compatible only with a moderate entropy. In an environment of very low entropy, a living organism would not be able to resist the onslaught of the free energy hitting it from all parts. On the other hand, in an environment of very high entropy there would not be enough free energy going around for the sorting to be successful in the short run” (34). Because of the generation of complexity in the region between order and disorder, this region is sometimes also referred to as the complex state or complex region. The complex state or region of the System is the region with an intermediate level of entropy, between order and disorder where the FTS can be sustained. Living systems must constantly adapt to ensure optimization (of operation), and to ensure a certain efficiency in a constantly evolving environment. The homeostatic imperative provides guidance and serves as a reference and ensures a certain stability. Chaotic dynamics are highly instrumental in selecting – ‘finding’ – optimal solutions in FFE-conditions; in selecting innovations that can contribute to the sustainment of the operation and functioning of the FTS, and its components. In case of chaotic dynamics – between order and disorder – there is a combination of randomness and large-scale regularities. Chaotic war dynamics and the complex state of the (State-)System are related. Through chaotic dynamics new microstates can be explored. The KA of the (State-)System – war dynamics – are instrumental in a process of exploration – finding new solutions and opportunities – and in their selection. Periodic dynamics on the other hand, are much more limited in their ability to explore. Periodic dynamics are less restrained in their magnitude: Periodic dynamics lack a third – restraining – degree of freedom. This – the absence of a third degree of freedom – explains why the (State-)System produced a series of “unrestrained” non-systemic KA/wars with a large size and magnitude, during the 1st exceptional period. This is a schematic representation of the complex region, between order and disorder. In the complex region there is an intermediate level of entropy. Entropy is equivalent with disorder, new possibilities and uncertainty, generated through irreversible processes in the System. The FTS regulates EMIS-flows in the System and with its environment. During the transient period (1480-1945), the 1st FTS ensured that the (State-)System was maintained in the complex (viable) region, between order and disorder; however, the viability and efficiency of the System were temporarily diminished during the 1st exceptional period (1657-1763), when the non-systemic KA was not chaotic but periodic in nature. The chaotic nature of non-systemic KA not only introduces an important element of unpredictability (because of the high sensitivity for initial conditions), but also the ‘ability’ of the System to explore new micro states and configurations, and to innovate (66). New configurations – the periodic upgrading of the order of the System – require innovation and chaotic war dynamics. The instability of motion associated with chaos allows the System to continuously explore its phase space, “thereby creating information and complexity” (66). Innovations in this context, must not be understood as very specific – for example – technological innovations. The innovations in this context concern solutions that satisfy the demands – the specific constraints – imposed by the Second Law and related principles that apply FFE, on the (State-)System. KA (non-systemic wars) – but also for example terrorist attacks – are triggered in responses to entropic perturbations (and resulting gradients). The KA is also part of the explorative activity of the System, to find solutions for ‘discrepancies’ in the physical domain. The KA provides a ‘template’ for social development and evolution (in the contingent domain). The solutions that are found and ‘implemented’, include modifications to the RSP’s configuration (within the existing stability domain), and are embedded in the VC’s of the RSP. Chaotic war dynamics generate solutions and innovations that feed the process of nucleation of VC’s in the System. The configuration of the network of VC’s is important for the generation of a network-effect. VC-clusters can be considered a ‘map’ – a blueprint – that ‘emerges’ from the exploration of state space during RSP’s through chaotic dynamics. The accumulation of tensions, and such a blueprint are prerequisites for the System to become critical and produce a systemic response (a systemic war) with the right properties to allow the System to search for and find a new stable state (RSP). The nucleated VC-clusters contain the solutions for the upgrade of the order and can be considered a gateway to the next RSP. 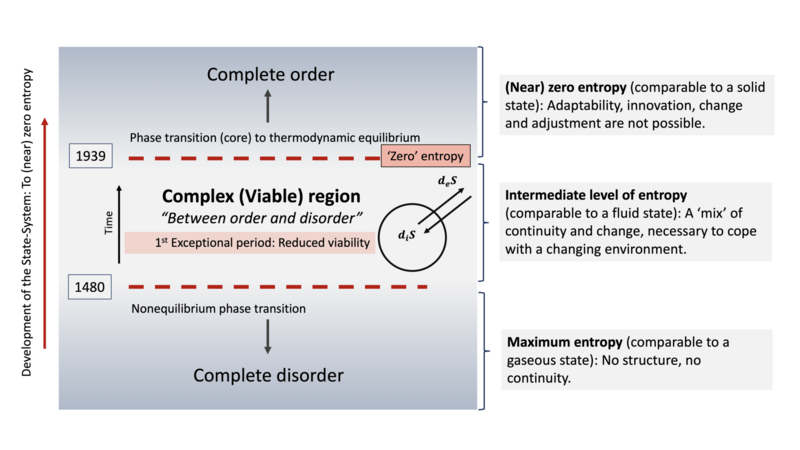 Without chaotic war dynamics, there is no suitable nucleation of VC’s and consequently no network-effect and accumulation of entropy necessary for the System to become critical and be able to upgrade to the next level of organization and continue the most efficient path to thermodynamic equilibrium.